A massive fire completely destroyed the roof and spire of the iconic Notre Dame Cathedral in Paris on Monday, but firefighters said they were able to save the shell of the stone structure from collapse. French prosecutors said on Tuesday that the blaze likely was caused by accident, and that there was no obvious indication of arson. Fifty people are working on the investigation. 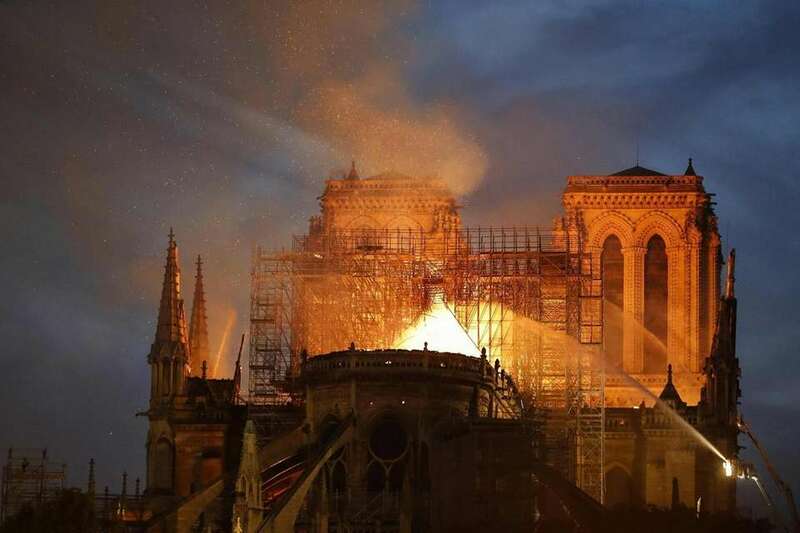 Smoke and flames were first spotted billowing out of the medieval cathedral made famous in Victor Hugo's classic novel "The Hunchback of Notre-Dame" on Monday afternoon. Distraught Parisians and stunned tourists gazed in disbelief as the inferno raged into the night. Thousands of onlookers lined bridges over the River Seine and along its embankments, held at a distance by a police cordon. One firefighter was injured, but no one else was hurt, officials had said. The cathedral was in the midst of renovations, with some sections under scaffolding. Some of the bronze statues were removed last week as part of the repairs. The cathedral dates to the 12th century and attracts millions of tourists a year. A fire ravages Notre Dame Cathedral in central Paris on Monday evening. Firefighters douse flames shooting from the roof of the Notre Dame Cathedral in central Paris on Monday. A crowd looks on as flames and smoke billow from the roof at Notre Dame Cathedral in central Paris on Monday. Bystanders look on a fire rages at the Notre Dame Cathedral in central Paris on Monday. Flames damage the Notre Dame Cathedral in central Paris on Monday. Flames and smoke are seen billowing from the roof at the Notre Dame Cathedral in central Paris on Monday. A firefighter uses a hose to douse flames and smoke billowing from the roof at the Notre Dame Cathedral in central Paris on Monday. Fire engulfs the landmark Notre Dame Cathedral in central Paris on Monday. Smoke and flames rise during a fire at the landmark Notre Dame Cathedral in central Paris on Monday. Seen from across the Seine River, smoke and flames rise during a fire at the Notre Dame Cathedral in central Paris on Monday. Flames shoot from the roof of the Notre Dame Cathedral in central Paris on Monday. Flames and smoke are seen billowing from the roof at Notre Dame Cathedral in central Paris on Monday. A man looks on Tuesday at the damage caused to Notre Dame Cathedral after a fire Monday. People view the damage at the cathedral after firefighters worked to extinguish the blaze. The fire consumed the roof of the Notre Dame Cathedral.